Food & Beverage Solutions | Berg Chilling Systems Inc.
Eco-positive, chilling management solutions for the global food and beverage market. A truly trustworthy cooling solution must be cost-effective, efficient, and robust enough to handle the rigorous demands of the food and beverage sector. Today’s consumers demand the highest standards when it comes to food and beverage processing. 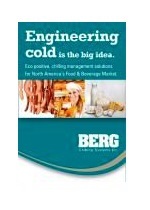 To exceed customer expectations, maintain cost competitiveness, and meet regulatory requirements, food and beverage producers turn to Berg for total chilling solutions. For over 40 years, Berg has provided industrial process temperature control solutions with chilling, pumping and freezing equipment to achieve proper food processing temperatures and maintain the cold chain to prevent spoilage. 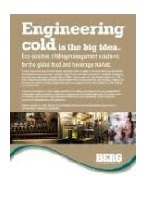 Berg works with companies in the meat, poultry, seafood, dairy, bakery, produce, crop production, brewery, candy and soft drink industries to develop custom engineered chilling solutions suitable for their needs. 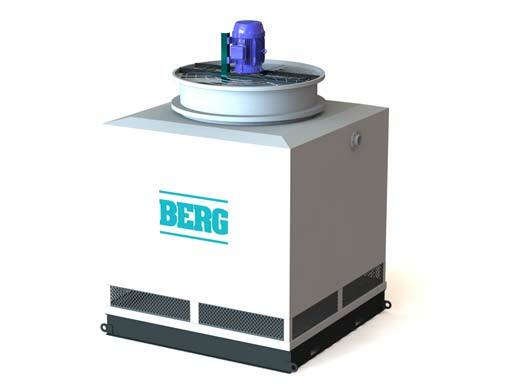 Berg shell ice machines are used in the food and beverage industry in many ways. Shell ice can be used for preserving perishables such as produce, meat, poultry and seafood, as a water ingredient in bread making, or as chiller tank ice for poultry and meat processing. The shell ice machines can also be used to produce blood plasma and frozen juices. 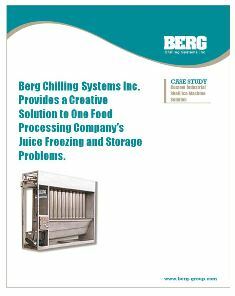 For more information on the Berg shell ice machine please watch our video on YouTube. We also have expertise in providing chilling equipment for air or water cooling for all meat processes including halal food, cooling and curing, climate control for cheese making, process control for dairy, process cooling for brewery, distillery, and wine sectors, confection cooling, flash freezing of food, individual quick freezing, tunnel and batch freezing, and bulk liquid freezing. We are also experts in fermentation temperature control for macro and micro-breweries.